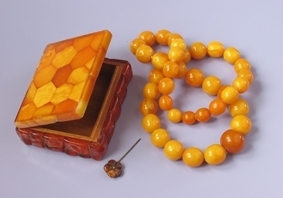 A special attention was given to the quality of making and high artistic level of amber articles. From the beginning of the 1930s a wide advertising campaign was launched aimed at promotion of the «German gold» within the country. The “Day of Amber” was celebrated in Palmniken where huge models of the production were shown during a gorgeous parade. The most numerous group included jewelry articles. The other group comprised of the household articles. The third consisted of the articles of religious faith. The fourth group involved souvenirs, commemorative medals, sports prizes as well as various badges. The same can be said about Jan Holschuh, Brachert’s follower. After becoming an artistic head of the Manufactory in 1933, he set an aim of widening the production program and initially setting a high artistic standard for the articles. 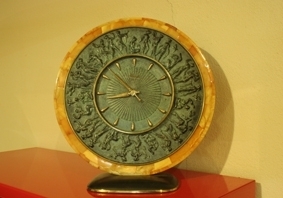 Under his leadership and on the basis of his designs the Manufactory started making high quality and expensive household articles along with mass production. 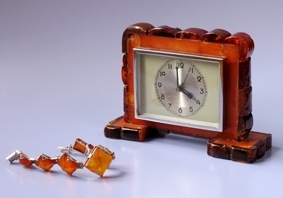 In the 1930s-1940s the production of the Konigsberg State Amber Manufactory could be found in the largest shops in many European capitals. The natural beauty of the «sun stone» showed itself most vividly in brooches and pendants. Due to the peculiarities of the structure, it was in those articles that the repeatedly polished “wild” stone turned into noble cabochon whose beauty was emphasized by the dim shine of silver. The common motives for making brooches were plant leaves, flowers and fruits. Tendencies that existed in the applied art of that time promoted opening new possibilities for using the material and establishing the style characteristic of the Manufactory’s articles including the distinctive mosaic composition. For example, the symbols of power for burgomisters were made on special orders, as a rule, in a single copy, while badges could be produced in thousands and millions. Among such articles are badges in the form of a leaf or a flower that were awarded to the participants of the campaign “Winter assistance” in the course of which clothes and foods were collected for the unemployed and needy in 1933-43s. The Manufactory produced approximately 60 million of such badges. Plaquettes and lockets in honour of important events were also made in large numbers. Among them is the locket with the image of the Konigsberg Cathedral made in 1933 for the 600th anniversary of its foundation and a badge of the “German East Fair” whose making was timed for conducting an agricultural exhibition in Konigsberg in 1936. A lot of attention was invariably given to souvenir production reflecting the original East Prussian flavour. Here amber was used as a unique “brand name” material. The motives for the articles were national East Prussian symbols. Among them was traditionally an image of an elk. A typical Konigsberg souvenir was Kant’s miniature commemorative plaque whose copy one can see today at the base of the Castle wall. The famous philosopher’s aphorism on it runs as follows, “Two things fill the mind with ever new and increasing admiration and reverence, the more often and more steadily one reflects on them: the starry heavens above me and the moral law within me”. 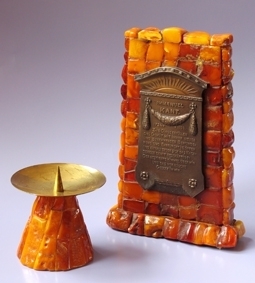 Amber under the advertising slogan “German gold” became equal in the row of materials that were traditionally used for making such articles. Amber shopping… best place to go to is Riga, Latvia’s old capital, a treat in itself. Many artefacts there….plus Swastikas and related artefacts. A very pro-National Socialist nation. ‘The Canada of Europe’. I plan on visiting next summer. My Honor Ring was hand made with original German tooling by a true believer in Riga and I feel Latvia is an important part of my pilgrimage. I did not know what kinds of treasures I might find but your insight has inspired me to search out shops with amber.